Hi again, everyone! Thanks for continuing to stick by me as I suffer through my last exams as a 1L in law school. After tomorrow's Property exam, I have Civil Procedure to take on Wednesday and then I'm home free. Thankfully, I think my exams are in order from most difficult to least difficult! Last month, I showed you a beautiful pink foil polish from Ruby White Tips. 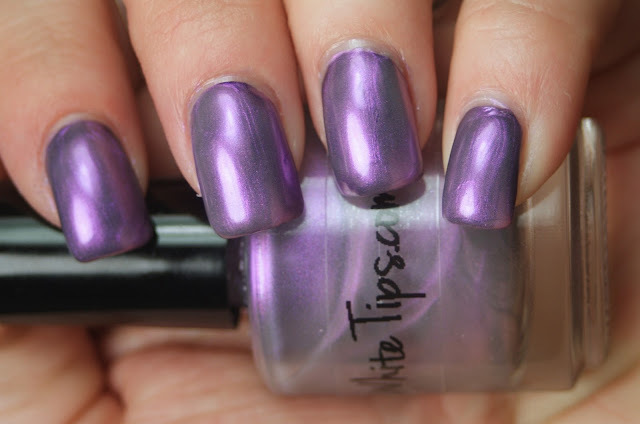 Laura, the brilliant woman behind RWT, sent me another polish that will soon be listed on her Etsy page: Amethyst. Amethyst is gray to purple duochrome with frosty shimmer. Above is with three coats on its own. I really loved the surprise of this polish. I think it would be nice for anyone to wear to work because of the muted neutral of the gray, but with the surprise pop of the purple shimmer! And here is two coats of Amethyst over one coat of Rimmel Black Satin. It loses the gray to purple duochrome over black and instead, takes on a light purple to dark purple quality. I think I prefer it on its own better, but that's not to say it isn't pretty on its own. I love how metallic it is over black. It reminds me a little of Deborah Lippmann Wicked Game and Wet n Wild Gray's anatomy. HOWEVER, this shade has a lot more purple to it, especially over black. Also, the brushstrokes are not nearly as noticeable in Amethyst. So I will totally reach for this first! Amethyst will so be available in the Ruby White Tips Etsy store, along with the existing variety of other amazing colors! It is $8.50 for a full-sized, .45 oz bottle. It's vegan and 3-free, to boot! So what do you think of Amethyst?